Cadillac may not know what it wants to be moving forward, but its past is set in stone, and that’s a history rife with over the top luxury cars like today’s Nice Price or Crack Pipe Eldorado. Let’s see just what that history lesson might cost. There’s something intrinsically romantic about an old Vespa scooter. You and your main squeeze riding tandem, a basket with a baguette, some cheese and a bottle of Chianti behind, and all the world in front of you. Add to that picture the sidecar featured on yesterday’s 1969 Piaggio Vespa scooter and you can even take along a mother-in-law, or third-wheel best friend. Good thing the sidecar is detachable. A not so good thing apparently, was that bike’s $7,500 price. That earned it a 51 percent Crack Pipe loss in a squeaker of a vote. Oh well, so much for romance. Let’s reflect for a minute on the American auto industry, okay? It’s been around for well over a century, and for the first half of that time car makers in the U.S. had the playing field pretty much to themselves. Then, just after WWII things began to change. It was then that foreign makes, oftentimes with cheaper and more efficient cars started to trickle into the market. By the mid-fifties the American manufacturers started to take notice and introduced their own smaller and sometimes quirkier models to stem the tide. That seemed to hold back the interlopers into the sixties, but by the seventies Japanese car makers opened the flood gates leaving their U.S. competitors befuddled by unfamiliar concepts such as fuel economy and build quality. By the ‘80s America started competing again, with small cars that, while not great, were at least marginally competitive with their Japanese counterparts. It was at this time that American car makers also started to take on the upper-scale European imports of the time. This took a totally different track. 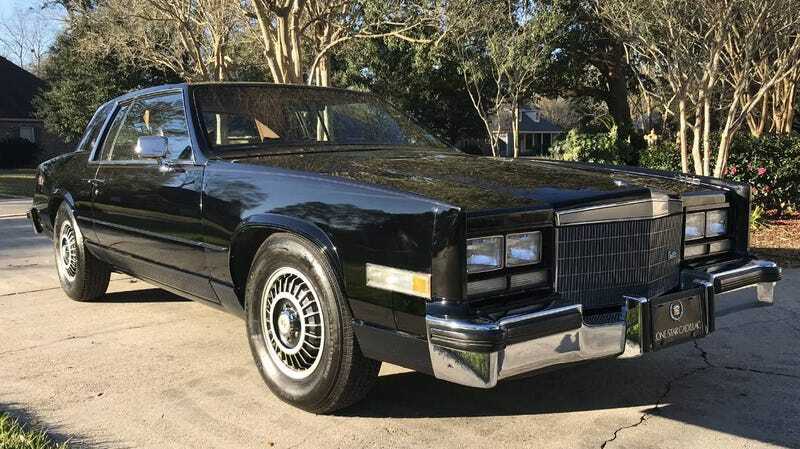 The U.S. car makers took existing cars and modified them with stiffer suspension and “black-out” trim, and cheekily called them “Euro.” That was what the Americans thought would satisfy buyers cross-shopping the likes of BMWs and Mercedes, and it’s what gave us today’s 1983 Cadillac Eldorado Touring Coupe. Now, the Eldorado name goes back decades, and over that time it represented status, ostentation, and physical presence. The Eldo was designed to be the car the valet parked out in front. All that started to winnow away in the ‘70s. The gas crisis demanded smaller, more efficient models and the whole idea of ‘luxury’ started to evolve. The eighth generation Eldo rolled with those changes, shrinking in wheelbase, overall length and available engine sizes, as did its Olds Toronado platform mate. Smaller doesn’t mean sporty, but with the Touring Coupe, Cadillac at least tried. In place of the standard car’s faux wire wheel covers, the TC offers handsome black accented alloys. Those are wrapped in aggressive blackwall tires in place of the whitewalls spec’d on the granddaddy edition. A stiffer, moderately more capable suspension sat behind the rollers, and the whole thing was topped off with a body that had most of its brightwork muted. It’s all oddly serious, and viewed from today’s standards it seems almost modern. Of course it’s not. No one builds big FWD coupes with these sort of proportions any more. This may have been one of Caddy’s attempts at downsizing, but it’s still hella big. It’s also pretty impressive. The piano black respray looks to be in terrific shape in the pics and is appropriate for the car. It also sets off the alloys and the biscuit leather interior nicely. Inside you’ll find Cadillac’s funky digital dashboard. That’s nothing special today, but back in the ‘80s it was like driving around in the Space Shuttle. You’ll also find an almost completely flat floor, which makes the Touring Coupe’s bucket seats and center console almost a shame. The standard Eldo bench made better use of the space, allowing for aggressive games of footsie between driver and passenger. Still, this car has an exceptionally inviting interior. Honestly, I’d just like to slip in there and breath in all the old school cool. The seller says that the car sports a mere 61,000 miles on the clock. The engine is an HT4100, but it’s a later replacement that he says addresses the foibles of the earlier editions. That’s a 4087-cc OHV V8 with an electronically-controlled TBI and oddly enough, an aluminum block with cast iron heads. Horsepower here was a lukewarm 135. Those meager ponies are pressed into service by a 3-speed Turbo Hydromatic that is claimed to have been rebuilt just two months back. The car is also said to have been garage kept and comes with a clean title and price tag that has recently been lowered $2,000 to $15,500. It’s now time for us to all vote on whether that price has been lowered enough. What do you think, is this Eldorado desirable and decent enough to be worth that kind of scratch? Or, for that much, would you not take it on your next tour? Lafayette, LA Craigslist, or go here if the ad disappears. H/T to @DanBrush on the Twitter for the hookup! At $7,500, Could This 1969 Piaggio Vespa 150 With a Sidecar be Your New Sidekick?